I grabbed Lovely, Dark and Deep by Amy McNamara out of my stack of books on a whim, not knowing exactly the lasting effect the book would have on me. It’s one of the most beautifully written books I’ve read in a very long time. When I opened the book and began reading, I was hooked right away – within two or three pages. The language is so poetic, and yet it has a choppy barrenness to it that makes it seem as soft and desolate as the Maine forest in which it is set. The book is paced nicely and has a quiet tone to it. Character-driven, the story has characters that are full and developed and very interesting to read. Wren Wells has had a tough time bouncing back after the car accident that took the life of her boyfriend. She had no will to maintain any of the relationships in her life, so she just…moved away and felt an odd comfort in being more isolated and grieving alone. Wren’s tragedy and grief is so deep and yet you are drawn to her thoughts, her words, her movements. A chance encounter with Cal Owen during a routine jog outside turns Wren’s world upside down. 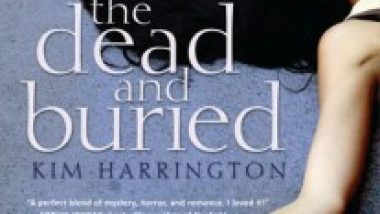 Cal has an attraction to Wren, but it is not just a physical attraction. The attraction comes from having something in common, from having struggles and difficulties in life. Cal’s story is not the same as Wren’s, but they are able to find some comfort in the fact that each of them understands grief and difficulty. They understand that not all days are great days – in fact, some days aren’t even good – but if they stick together eventually they will have lovely moments, happy moments, moments they can cherish and hold onto and build on. Finding another person – just one other person – to share her grief, even though his is so very different, makes a huge impact on both Wren and Cal. Lovely, Dark and Deep is a book that I want more people to read. The story is just…great. The writing is so lyrical and poetic and beautiful, and it portrays the emotions of the characters wonderfully. I highly recommend this book to readers who love young adult contemporary books with romance and issues and also books with lovely language.